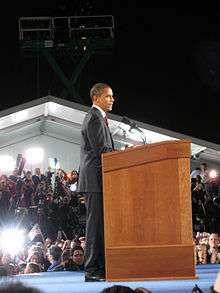 The 2008 presidential campaign of Barack Obama, then junior United States Senator from Illinois, was announced at an event on February 10, 2007 in Springfield, Illinois. 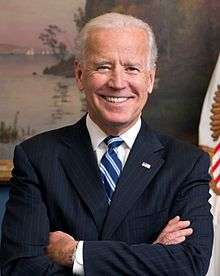 After winning a majority of delegates in the Democratic primaries of 2008, on August 23, leading up to the convention, the campaign announced that Senator Joe Biden of Delaware would be the Vice Presidential nominee. 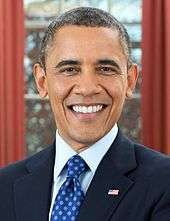 At the 2008 Democratic National Convention on August 27, Barack Obama was formally selected as the Democratic Party nominee for President of the United States in 2008. He was the first African American in history to be nominated on a major party ticket. Obama's vice presidential running mate had been a subject of speculation since the end of the primaries. As of August 2008, some of the most popular choices for VP included, but were not limited to, Clinton, Biden, Indiana Senator Evan Bayh, Kansas Governor Kathleen Sebelius, Virginia Governor Tim Kaine, retired General and former Secretary of State Colin Powell, New Mexico Governor Bill Richardson, and retired General Wesley Clark. 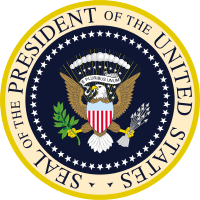 On August 21, 2008, Obama announced that he had made a selection for the VP spot, but would not reveal until August 23 who it was. Obama's campaign encouraged supporters to sign up for a text messaging system that would alert them the moment he announced his choice. On August 22, KMBC News of Kansas City spotted bumper stickers of an Obama/Bayh '08 ticket that were being printed in Lenexa, Kansas. Three sources close to a local printing plant reported that such material was being produced. The image of the bumper sticker circulated on the internet. However, NBC News later quoted sources stating that Bayh had been informed by Obama's campaign that he was not the pick. According to an Associated Press report that same evening, Joe Biden was selected as Obama's candidate. The Associated Press report was confirmed several hours later, on August 23, on his official campaign website and by a mass text message to supporters. Obama selected Biden to be vice president for three reasons: he could relate to blue-collar Americans (i.e. he is originally from Pennsylvania—arguably a blue-collar state); he has a multitude of connections on Capitol Hill; and he has more personal connections in foreign policy than Obama. On June 4, John McCain proposed a series of ten joint town hall meetings with Obama, at which the two could engage each other. Obama first agreed in principle to the notion, but later rejected McCain's proposal, offering instead one town-hall event on the Independence Day holiday and four traditional debate-style joint appearances. Hank Paulson, President Bush's Treasury Secretary, said Obama's comprehension of the financial crisis compared to McCain’s was as broad as "night and day". McCain’s confidence vastly lowered when Obama questioned his ideas on the financial crisis in a meeting on September 25 at the White House with Bush and other congressmen. McCain did not have suggestions regarding what he would do to fix the economy, particularly Henry Paulson’s $700 billion three-page bank recovery plan (TARP). Neither McCain nor Bush had read it. Obama’s confidence escalated from that point. This was the turning point of the campaign. On September 15, 2008 financial services firm Lehman Brothers filed for Chapter 11 bankruptcy protection, setting off a series of events leading to a 4.4% Dow Jones loss, at the time the largest drop by points in a single day since the days following the attacks on September 11, 2001. That stock market loss was subsequently exceeded by an even larger −7.0% plunge on September 29, 2008. On June 19, Obama was the first major-party presidential candidate to turn down public financing for a general election campaign since the system was created in the aftermath of Watergate. Obama was expected to raise $265 million between the time of the announcement and election day. By rejecting the funds in favor of private donations, the campaign was in a position to outspend John McCain prior to the election. Had he signed on to the plan, the campaign would only have been able to spend $84.1 million between the party convention in August and the general election in November. A campaign sign in a window in Arlington, VA. The signature campaign typeface was Gotham, typically using capital letters with occasional use of the script Snell Roundhand. Gotham was designed in 2000 by Jonathan Hoefler and Tobias Frere-Jones, originally for GQ' magazine. Prior to Gotham, the campaign used the typeface Gill Sans in upper case and lower case. Another Hoefler and Frere-Jones font, Requiem, was used for the campaign logo. U2's "City of Blinding Lights" was often played in anticipation of Obama's speeches during campaign events. Bruce Springsteen's "The Rising" was also played heavily during his campaign rallies. Barack Obama personally asked Joss Stone in August to write and record his presidential campaign song, reportedly due to the fact that she appeals across racial boundaries. Ben Harper's "Better Way" was also played at a few events throughout the campaign. Furthermore, Obama's candidacy inspired artists to create more unsolicited music and music videos than any other candidate in American political history. Examples include "Yes We Can" by will.i.am, of the band The Black Eyed Peas; "Make it to the Sun" by Ruwanga Samath and Maxwell D; Barack Obama" by JFC; and "Unite the Nation" by the Greek-American hip hop group Misa/Misa. 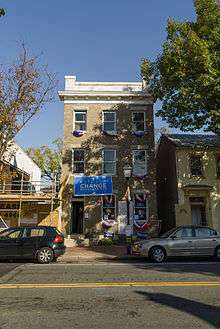 An Obama 08 campaign office in Arlington, VA, photographed November 1, 2008. Obama was particularly noted for his use of the Internet to rally supporters and make his policies known. He is the first US president to have effectively used the internet and social media for successful political outcomes. His successful presidential campaign raised the bar and are now presidential standards. Ira Forman, executive director of the National Jewish Democratic Council stated that "The Democratic operation in the Jewish community was more extensive than I've seen in 35 years," The chairman of the campaign in Israel, Yeshiyah Amariel, and others such as the Jewish Alliance for Change and the Jewish Council for Education & Research used YouTube to release video endorsements from officials and normal people in Israel for Obama and his positions (such as "Israelis for Obama" and "right man for the job.") In the closing weeks of the election the campaign used support from Israelis to fight the smears spread online by bloggers. Its success caused the polls of Jewish support for Obama to increase so that by the time of the Nov 4 election, according to exit polls, 77% of the voting American Jewish community voted for Obama over the 23% that were for John McCain. ↑ "Obama Launches Presidential Bid," BBC News, February 10, 2007. Retrieved on January 14, 2008. Video at Brightcove.TV. 1 2 "Joe Biden!". BarackObama.com. Archived from the original on August 27, 2008. Retrieved August 28, 2008. 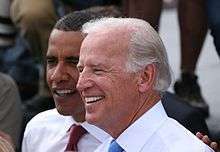 Breaking news: the text message is out and it's official ... Barack Obama has selected Joe Biden to be his running mate! ↑ Adam Nagourney (August 28, 2008). "Obama Wins Nomination; Biden and Bill Clinton Rally Party - NYTimes.com". Nytimes.com. Archived from the original on April 25, 2009. Retrieved October 17, 2008. 1 2 Jeff Zeleny, "Obama Clinches Nomination; First Black Candidate to Lead a Major Party Ticket," The New York Times, June 4, 2008. Retrieved July 5, 2008. ↑ "Barack Obama wins presidential election". CNN. November 4, 2008. Archived from the original on November 4, 2008. Retrieved November 5, 2008. ↑ Nagourney, Adam (November 5, 2008). "Obama Wins Election". The New York Times. Archived from the original on April 25, 2009. Retrieved November 5, 2008. 1 2 "Congress meets to count electoral votes". MSNBC. January 8, 2009. Archived from the original on January 21, 2009. Retrieved January 8, 2009. ↑ Nagourney, Adam (November 4, 2008). "Obama Wins Election". New York Times. Archived from the original on December 9, 2008. Retrieved November 5, 2008. ↑ "McCain wins GOP nomination; Huckabee bows out," CNN News, March 5, 2008. Retrieved July 7, 2008; Simon Rushton, "McCain clinches Republican prize," CNN News, March 4, 2008. Retrieved July 7, 2008. ↑ Sasha Issenberg, "Clinton ends her bid, hails Obama," The Boston Globe, June 8, 2008. Retrieved July 5, 2008. See also: Adam Nagourney and Jeff Zeleny, "Clinton Ready to End Bid and Endorse Obama," The New York Times, June 5, 2008. Retrieved July 7, 2008. ↑ Jeff Zeleny, "Obama Gives $2,300 for Clinton Debt," The New York Times, June 27, 2008. Retrieved July 7, 2008. ↑ "Clinton and Obama rally together," BBC News, June 27, 2008. Retrieved July 7, 2008; Mark Leibovich and Jeff Zeleny, "Obama and Clinton Hold First Post-Primary Event," The New York Times, June 28, 2008. Retrieved July 7, 2008. ↑ Michael Luo and Christopher Drew, "Obama Picks Up Fund-Raising Pace," The New York Times, July 3, 2008. Retrieved July 6, 2008. See also: "Obama, Clinton to hold joint fundraisers in NY," Associated Press, July 5, 2008. Retrieved July 7, 2008; Jonathan Weisman, "Obama and Clinton, Together Again," Washington Post, July 5, 2008. Retrieved July 7, 2008. ↑ Mooney, Alexander (August 21, 2008). "Obama: I've decided on my running mate", CNN. Retrieved July 9, 2010. ↑ "Bumper Sticker Could Indicate Bayh Is Obama's Veep". KMBC News. August 22, 2008. ↑ "Bayh, Kaine out of Obama's veep race". MSNBC. August 22, 2008. ↑ "Obama picks Biden for veep". Daily Press. Victorville, California. Associated Press. August 25, 2008. Archived from the original on August 14, 2011. Retrieved July 9, 2010. 1 2 3 4 5 Alter, Jonathan (2010). The Promise President Obama, Year One. Simon & Schuster. ISBN 978-1-4391-0119-3. ↑ Carlotta Gall and Jeff Zeleny, "Obama Opens a Foreign Tour in Afghanistan," The New York Times, July 20, 2008. ↑ Liz Sly, "Obama arrives in Baghdad," Chicago Tribune, July 21, 2008. Retrieved July 31, 2008. ↑ Mike Dorning, "Obama has press wondering what his real motives are," Chicago Tribune, July 22, 2008. Retrieved July 31, 2008. ↑ Mike Dorning, "'Friend of Israel' also woos Palestinians," Chicago Tribune, July 24, 2008. Retrieved July 31, 2008. ↑ Kim Barker, "Obama, Karzai keep talk 'positive'," Chicago Tribune, July 21, 2008. Retrieved July 31, 2008. ↑ Jeff Zeleny and Steven Erlanger, "3 Hours in Paris, and Smiles All Around," The New York Times, July 26, 2008. Retrieved July 31, 2008; Elana Schor, "Obama arrives in Paris to meet Sarkozy," The Guardian, July 25, 2008. Retrieved July 31, 2008. ↑ Peter Walker, "Obama hails US-UK ties after talks with Brown at Downing Street," The Guardian, July 26, 2008. Retrieved July 31, 2008. ↑ "Obama's Berlin Speech: People of the World, Look at Me". Spiegel Online. July 25, 2008. Archived from the original on October 24, 2008. Retrieved October 23, 2008. ↑ Erlanger, Steven (July 25, 2008). "Obama, Vague on Issues, Pleases Crowd in Europe". The New York Times. Paris. Retrieved August 27, 2012. ↑ Jeff Zeleny and Nicolas Kulish (July 25, 2008). "Obama, in Berlin, Calls for Renewal of Ties With Allies". The New York Times. Berlin. Retrieved August 27, 2012. ↑ Commission on Presidential Debates Announces Sites, Dates, Formats and Candidate Selection Criteria for 2008 General Election, Commission on Presidential Debates, November 19, 2007. Retrieved July 6, 2008. ↑ "Gun Ruling Reverberates," The Hartford Courant, June 27, 2008. Retrieved July 6, 2008. ↑ Jennifer Parker, "Political Radar: The Debate Over the Debates," ABC News, June 4, 2008. Retrieved June 6, 2008; "Obama says he's humbled by victory, confident of party unity," CNN News, June 4, 2008. Retrieved July 7, 2008. ↑ Tahman Bradley, "Obama Open to McCain Town Hall," ABC News, June 4, 2008. Retrieved June 6, 2008. ↑ Nedra Pickler, "McCain, Obama fail to agree on town halls," Associated Press, June 13, 2006. Retrieved June 13, 2008. Archived June 17, 2008, at the Wayback Machine. ↑ Michael Grynbaum (2008-09-15). "Wall St.'s Turmoil Sends Stocks Reeling". The New York Times. Archived from the original on April 11, 2011. Retrieved 2008-09-15. ↑ "Obama, McCain Meet In Mississippi". WAPT.com. December 29, 2008. Retrieved December 30, 2008. ↑ "U.S. Senate Roll Call Votes: 110th Congress, 2nd Session". Senate.gov. Retrieved April 2, 2013. ↑ CQ Transcripts Wire (November 4, 2008). "Sen. Barack Obama's Acceptance Speech in Chicago, Ill.". The Washington Post. Retrieved 2008-11-05. ↑ "Chicago News - 11/05/08". ABC. Retrieved 2008-11-05. ↑ "Rally crowd heads home for the night". The Chicago Tribune. Retrieved 2008-11-05. ↑ Gilbert, Debbie (November 6, 2008). "Residents relate the personal significance of this election". Gainseville Times. Retrieved 2008-11-08. 1 2 Cooper, Helene; Jeff Zeleny (November 11, 2008). "Obama's Transition Team Restricts Lobbyists' Role". New York Times. Archived from the original on December 11, 2008. Retrieved November 11, 2008. ↑ Luo, Michael (October 19, 2008). "Obama Recasts the Fund-Raising Landscape". New York Times. Archived from the original on April 2, 2009. Retrieved November 11, 2008. ↑ Kurtz, Josh. "Obama, DNC Set Up Fundraising Entity for States". Roll Call. Archived from the original on December 6, 2008. Retrieved November 11, 2008. ↑ Obama for America: Report of Receipts and Disbursements, Federal Election Commission. Retrieved April 3, 2008. ↑ Jeff Zeleny, "Obama Raises $52 Million in June," The New York Times, July 17, 2008. Retrieved July 17, 2008. ↑ Jonathan D. Salant, "Obama Won't Accept Public Money in Election Campaign," Bloomberg, June 19, 2008. Retrieved June 19, 2008. 1 2 Ewen MacAskill, "US elections: Obama faces backlash for refusing public campaign funding," The Guardian, June 20, 2008. Retrieved June 21, 2008. ↑ Emily Cadei, "Q & A: Obama's public funding opt-out," USA Today, June 20, 2008. Retrieved June 21, 2008. ↑ Kenneth Vogel, "Obama move irks reform allies," The Politico, June 19, 2008. Retrieved June 21, 2008; Liz Sidoti, "With money, Obama to try to widen the battleground," Associated Press, June 20, 2008. Retrieved June 21, 2008. See also: Alan Silverleib, "Analysis: Rejecting public funding won't hurt Obama," CNN News, June 20, 2008. Retrieved July 7, 2008. ↑ John Dickerson, "The Flip-Flop Brothers," Slate, June 20, 2008. Retrieved June 21, 2008. ↑ Nico Pitney (September 4, 2008). "Obama Raises $10 Million After Palin Speech". The Huffington Post. ↑ Cooper, Christopher; Meckler, Laura (October 19, 2008). "Obama Takes in a Record $150 Million, But McCain Narrows Gap in Some Polls". Wall Street Journal. ↑ Michael Isikoff (October 4, 2008). "Obama's 'Good Will' Hunting". Newsweek. ↑ MOSK, MATTHEW (October 25, 2008). "Online campaign donations spark new concerns of abuse". The Houston Chronicle. Archived from the original on October 29, 2008. Retrieved October 26, 2008. ↑ Munro, Neil (October 24, 2008). "FEC Rules Leave Loopholes For Online Donation Data". National Journal. National Journal Group Inc. Archived from the original on October 25, 2008. Retrieved October 26, 2008. ↑ Yue, Lorene (February 22, 2007). "Chicago designers create Obama's logo". Crain's Chicago Business. Archived from the original on December 11, 2008. Retrieved August 23, 2008. ↑ John McCain: Speech 06/03/08. YouTube. Retrieved on 2014-06-01. ↑ David Clegg-eron, change you can't believe in. Left Foot Forward (2010-04-20). Retrieved on 2014-06-01. ↑ "Change you can't believe in". The Economist. March 4, 2010. ↑ Pasick, Adam (January 15, 2009). "Iconic Obama poster based on Reuters photo". Reuters. Archived from the original on January 20, 2009. Retrieved January 20, 2009. ↑ Rawsthorn, Alice (April 6, 2008). "Brand Obama, a leader in the image war". International Herald Tribune. Archived from the original on December 19, 2008. Retrieved January 18, 2009. ↑ Adam, Tschorn (April 1, 2008). "Even Obama's typeface gets bloggers buzzing". Los Angeles Times. Archived from the original on December 5, 2008. Retrieved July 28, 2009. ↑ "U2 serenades Obama, gives Biden shout-out". Archived from the original on November 21, 2009. ↑ "Barack Obama Picks A Bruce Springsteen Song As His Acceptance Speech's Running Mate". ↑ "Joss Stone to record Barack Obama campaign song". www.nme.com. Archived from the original on August 15, 2008. Retrieved August 12, 2008. ↑ Lewis, Nick (February 14, 2008). "Campaign songs can be powerful – or perturbing – political tools". National Post. Retrieved December 16, 2010. ↑ See, for instance, YouTube search. ↑ Multi-National Artists Unite in Effort to Elect Barack Obama Through Song. Prweb.com. Retrieved on 2014-06-01. 1 2 Stirland,S. :,"Obama's Secret Weapons: Internet, Databases and Psychology", October 29, 2008. Retrieved on May 28, 2009. 1 2 Talbot, David (24 February 2009). "Personalized Campaigning". MIT Technology Review. Retrieved 3 December 2016. ↑ Talbot, David (19 August 2008). "How Obama Really Did It". MIT Technology Review. Retrieved 3 December 2016. ↑ Talbot, David (8 January 2009). "The Geeks Behind Obama's Web Strategy". Boston.com. Retrieved 3 December 2016. ↑ Xenos,M. and W. Lance Bennett. "THE DISCONNECTION IN ONLINE POLITICS: The Youth Political Sphere and US Election Sites, 2002–2004." Information, Communication, and Society 10 (2007): 443–64. ↑ Pasek, Josh, Daniel Romer, and Kathleen Hall Jamieson. "America's Youth and Community Engagement: How Use of Mass Media Is Related to Civic Activity and Political Awareness in 14-to-22-Year-Olds." Communication Research 33 (2006): 115–35. ↑ Sizemore, Justin (14 August 2008). "The Democratic Ground Game". Larry J. Sabato's Crystal Ball. Retrieved 3 December 2016. ↑ Creamer, Matthew (17 October 2008). "Obama Wins! ... Ad Age's Marketer of the Year". Advertising Age. Retrieved 17 June 2014. ↑ Creamer, Matthew (10 November 2008). "Barack Obama and Audacity of Marketing". Advertising Age. Retrieved 17 June 2014. 1 2 3 4 Mike Madden (July 16, 2008). "Barack Obama's super marketing machine". Salon.com. ↑ Laurie Segall (May 2, 2012). "Optimizely aims to give Obama 2012 a data edge". CNN Money. Retrieved March 18, 2015. ↑ Laurie Segall (April 24, 2012). "Romney uses startup hatched by Obama campaign". CNN Money. Retrieved March 18, 2015. ↑ John McCormick, "Obama in red, white and blue," Chicago Tribune, June 30, 2008. Retrieved July 6, 2008. ↑ John Harwood, "Aims of Democrats Reach Beyond the Oval Office," The New York Times, July 7, 2008. Retrieved July 7, 2008; Jonathan Martin and Ben Smith, "Obama's apple pie campaign," The Politico, July 7, 2008. Retrieved July 7, 2008; Andy Sullivan and Paul Thomasch, "TV ad spending to set record in presidential race," Reuters, July 2, 2008. Retrieved July 7, 2008. See also: Jim Rutenberg and Christopher Drew, "National Push by Obama on Ads and Turnout," The New York Times, June 22, 2008. Retrieved July 7, 2008. ↑ Jim Rutenburg, "Taking to the Airwaves," The New York Times, July 29, 2008. Retrieved July 30, 2008. See also: "General Election Campaign TV Advertising Spending Exceeds $50 Million in First Two Months of Campaign," University of Wisconsin–Madison Advertising Project, July 30, 2008. Retrieved July 30, 2008. ↑ "Obama's Prime-Time Appeal to Voters Appears on Numerous Networks in the Campaign's Final Stretch". CBS News. October 29, 2008. ↑ "Obama to Air Expensive TV Commercial". The Scotsman. October 29, 2008. ↑ Lisa de Moraes (October 30, 2008). "Obama Enters the League of Must-See TV". Washington Post. ↑ "Obama's Oct. 29 Simulcast Follows In Perot's Footsteps". Nielsen Wire. October 10, 2008. ↑ Dawn Teo (October 2, 2008). "Obama Campaign Buys Channel 73 on Dish Network". Huffington Post. ↑ Andrews, Wyatt (October 29, 2008). "Reality Check: The Cost Of Obama's Pledges". CBS News. Archived from the original on December 2, 2008. Retrieved December 9, 2008. ↑ "Obama hits back at Internet slanders". Agence France-Press. June 12, 2008. ↑ Tumulty, Karen (June 12, 2008). "Will Obama's Anti-Rumor Plan Work?". Time. Archived from the original on November 2, 2008. Retrieved November 7, 2008. 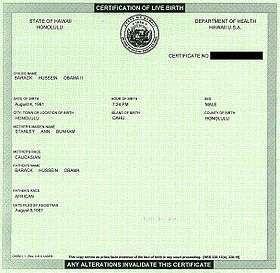 ↑ "The truth about Barack's birth certificate", Obama for America. Retrieved June 14, 2008. ↑ "The truth about Barack Obama and William Ayers Archived October 8, 2008, at the Wayback Machine. ", Obama for America. Retrieved 3-9-2009. ↑ "Next Generation Swift Boaters", Obama for America. Retrieved 3-9-2009. ↑ "The Truth About Barack's Faith", Obama for America. Retrieved 3-9-2009. ↑ ""Israel for Obama" Campaign". Israel for Obama blog. Archived from the original on November 10, 2008. Retrieved November 3, 2008. ↑ McGirk, Jan (July 23, 2008). "Obama In Ramallah". Huffington Post. Retrieved November 3, 2008. ↑ "Obama wraps up Middle East trip". U.S. Senator Barack Obama. Archived from the original on October 30, 2008. Retrieved November 3, 2008. ↑ "Details of Obama's Trip Released". washingtonpost.com. July 22, 2008. Archived from the original on September 8, 2008. Retrieved November 3, 2008. ↑ "Strong Outreach Contributed to Obama's Surge Among Jews". The Forward. November 6, 2008. Archived from the original on December 10, 2008. Retrieved November 9, 2008. ↑ "Voices for Obama resound from afar". Toronto: Globeandmail.com. October 27, 2008. Archived from the original on December 6, 2008. Retrieved November 3, 2008. ↑ Wheeler, Carolynne (October 31, 2008). "Palestinians toil for Barack Obama win". London: Telegraph.co.uk. Archived from the original on November 3, 2008. Retrieved November 3, 2008. ↑ "Black Jew Paves the Way in "israel for Obama"". Toere. November 9, 2008. Archived from the original on December 6, 2008. Retrieved November 9, 2008. ↑ NATHAN BURSTEIN (October 31, 2008). "What do Amnon Lipkin-Shahak, Moshe Ivgy and Jesse Dylan have in common?". Jerusalem Post. Retrieved November 3, 2008. ↑ Yitzhak Benhorin (October 5, 2008). "Obama good for Israel, say former Israeli generals". Ynet News.com. Retrieved November 3, 2008. ↑ Yeshiyah Amariel (October 12, 2008). "Fight the Jewish Blog Smears!". Zimbio.com. Archived from the original on July 18, 2011. Retrieved November 3, 2008. ↑ Haaretz Service and Agencies (November 5, 2008). "Obama wins 77 percent of Jewish vote, exit polls show". Haaretz. Archived from the original on December 10, 2008. Retrieved November 6, 2008. ↑ "Microsoft Word – Fact Sheet Energy Speech 082508 FINAL.doc" (PDF). Archived (PDF) from the original on October 17, 2008. Retrieved October 17, 2008. ↑ States are colored according to the average from at least the last three poll results from Statewide opinion polling for the United States presidential election, 2008. Washington, D.C. is presumed heavy Democrat. If there have been more than 3 polls taken within a month of the latest poll, then these are averaged. ↑ "McCain taps Alaska Gov. 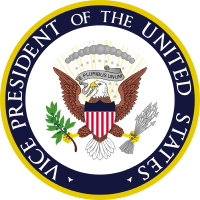 Palin as vice president pick". CNN. August 29, 2008. Archived from the original on September 13, 2008. Retrieved September 13, 2008. ↑ Cook, Charlie (September 9, 2008). "Time to Reassess the White House Race". MSNBC. Archived from the original on September 10, 2008. Retrieved September 13, 2008. ↑ MacAskill, Ewan (September 10, 2008). "The Palin effect: white women now deserting Obama, says survey". London: The Guardian. Archived from the original on September 13, 2008. Retrieved September 13, 2008. 1 2 General Election: McCain vs. Obama, RealClearPolitics. Retrieved November 3, 2008. ↑ Candidate Support by Political Party and Ideology Retrieved November 3, 2008. ↑ Obama: Favorable/Unfavorable, RealClearPolitics. Retrieved November 3, 2008. ↑ RealClearPolitics Electoral College: RealClear Electoral Count, RealClearPolitics. Retrieved November 3, 2008. ↑ RealClearPolitics Electoral College: No Toss Up States, RealClearPolitics. Retrieved November 3, 2008.